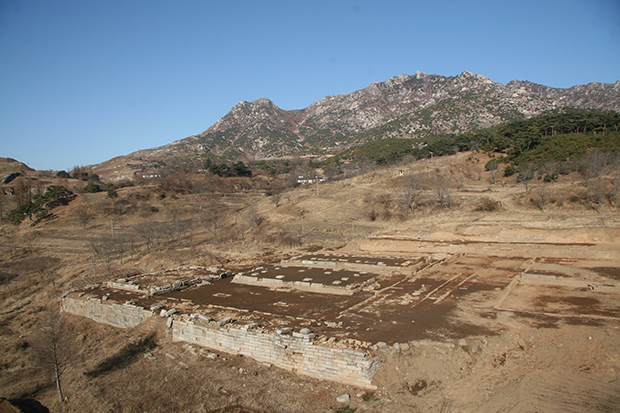 South and North Korea will resume their joint excavation of the site of an ancient palace in the North's border town of Kaesong late this month, Seoul's cultural heritage authority said Tuesday. The Cultural Heritage Administration said that it has agreed during a working-level meeting with the North's National Reconciliation Council in Kaesong on Thursday to conduct a joint survey and preservation of the Manwoldae site for three months from Sept. 27 to Dec. 27. Manwoldae was the palace of the Goryeo Dynasty (918-1392) for about 400 years. The two Koreas will hold a ceremony to celebrate the resumption of the joint project on Oct. 2, with relevant officials from both sides attending, the agency said. The Koreas conducted seven rounds of joint excavation of the historical site spanning 250,000 square meters of land from 2007 to 2015 and discovered traces of 40 buildings and 16,500 relics. The project, however, has since been suspended amid escalating tension on the Korean Peninsula over the North's missile and nuclear tests. During the world-level talks, South Korean officials proposed the resumption of other inter-Korean cultural cooperation projects, such as jointly adding the traditional Korean wrestling of "ssireum" on UNESCO's Intangible Cultural Heritage list and the joint excavation of Koguryo tombs in Pyongyang. Koguryo is an ancient kingdom that ruled the northern part of the peninsula. Also among the joint programs proposed were holding a survey of relics of the March 1st Movement (1919), one of the earliest public displays of the Korean resistance during the Japanese colonial rule of Korea, the 100th anniversary of the historical event and the publication of a common Korean-language dictionary.